Yes, he always puts bandages on his face. This review of Highlights for Children magazines is part of the Second Annual Natural Parents Network Holiday Gift Guide hosted by Natural Parents Network! I will be bringing you FIVE Gift Guide reviews over the next several days — so read about these products I love, and then come back to enter the giveaways on November 6. I solicited the prizes I'm reviewing specifically because I knew my family already loved them or because they were right up my kids' alley. I'm so pleased to present them to you over the next five days! This is a joint review and giveaway of Highlights for Children magazines between Natural Parents Network and Hobo Mama. Highlights has the perfect magazines for any child: Hello for ages 0-2, High Five for ages 2-6, and Highlights for ages 6-12, plus puzzle, geography, hidden pictures, and math magazines as well as educational books and toys. Highlights has been publishing "fun with a purpose" since 1946, and today's editions include engaging illustrations and enjoyable extras like stickers and cut-outs to engage any kid's interest. A subscription to one of Highlights' many magazines would make a perfect gift for a child of any age and a family interested in home learning. Our family has been reading Highlights magazines since … oh, right … since I was a kid! For all I know, my parents read them, too. 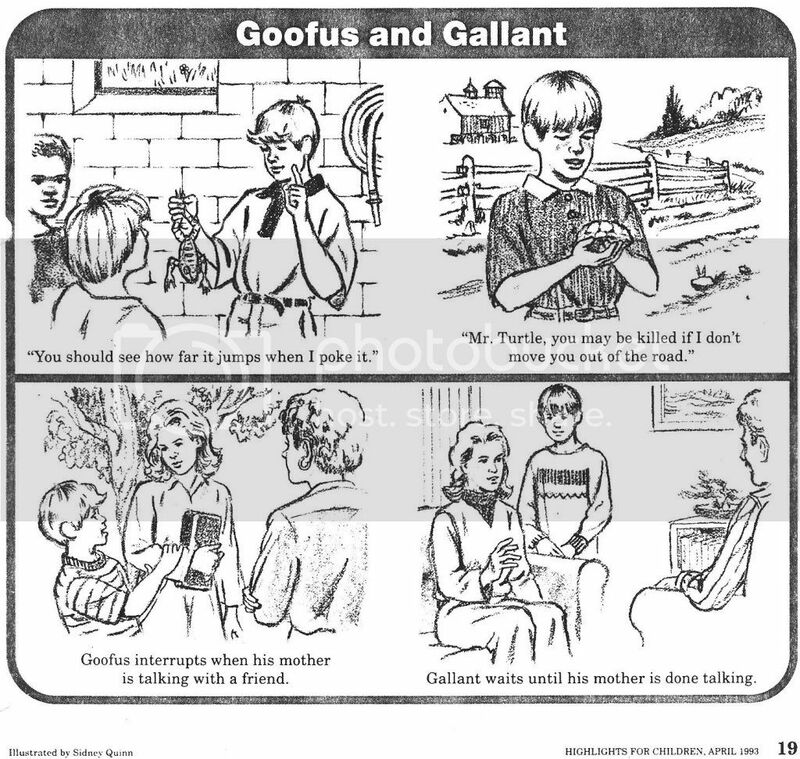 Who here remembers the old-school Goofus & Gallant, where Goofus had the ultra surfer bangs? Good times. So I was excited when my mother-in-law introduced us through gift subscriptions to the next generation of Highlights products, which go far beyond one offering. There are now magazines for every age group, from babies on up to tweens. We started Mikko off on High Five, which I've mentioned lovingly in my blog throughout the years. He's since graduated to many of the puzzle clubs, and Alrik's moved into the preschooler slot. There's a new magazine for babies and toddlers called Hello, which looks really sweet. This tear-proof magazine encourages parents and little ones to read and do simple activities together. We've loved High Five for the engaging stories, Spanish language learning, easy-to-follow recipes to cook, simple crafts, full-body exercises, whimsical poems, easy puzzles and games, and charming illustrations. The next step up is Highlights, for ages 6-12, which builds reading and logic skills through fiction, nonfiction, topical learning, and puzzles. Mikko has also passed on his Puzzle Buzz club to his little brother, which is an interactive puzzle magazine with lots of stickers. The stickers sell it, man. They make jigsaw puzzles and Hidden Pictures come alive. There are also silly searches and noticing differences, giving kids a good brain workout in patterns, matching, and logic. Writing the answers to Which Way USA? on his arm. Why? Why, indeed. He's also really into geography, so Grandma signed him up for Which Way USA? — a bound pack of two states comes in the mailbox. A map for each state guides us through the puzzles to discover clues about famous objects, people, and places. We happened upon Top Secret Adventures from the flyers that come along with his subscription, and we knew that was perfect for him, too, so had to grab it: A packet on a different country comes along with a guidebook, a keychain, and a set of bad-guy cards. As super spies, we work through the puzzles, learning about the country as we go, to determine which bad guy stole what from the host country. As you can tell, Highlights for Children magazines are all about education … but the kids have no idea. They're just so dang fun! The website offers bonus online features, such as audio stories, parents' guides, and online games. There's also a Classroom Store for teachers interested in incorporating the fun of Highlights into a school, with Classroom Rewards and a Teacher Toolbox. You can purchase your own 12-month subscription at Highlights.com for $34.44. Discounted multi-year and gift subscriptions are available and perfect for holiday gifting. If your child outgrows one magazine before your subscription ends, you can switch to the next age group up at no extra cost. If you buy a gift, you can send a special printable card to the child announcing the subscription. I love that a subscription is such a useful, experiential present — instead of clutter, your kid receives months of continuing fun and learning! As a homeschooling family, I can honestly say our subscriptions have been some of the best presents we've ever received for our children. Highlights has magazines for every age group: Hello for ages 0-2, High Five for ages 2-6, and Highlights for ages 6-12 — plus puzzle clubs for multiple interests: Puzzle Buzz, Puzzlemania, Which Way USA?, Top Secret Adventures, Hidden Pictures, and Mathmania. The store also features educational books, toys, science kits, and puzzles. Limited Time Only! Get $15 off all orders over $100. For your own chance to win a 12-month subscription of your choice of magazine (Hello, High Five, or Highlights) from Highlights for Children, or one of the 26 huge prize packages we're giving away, come back to this post on November 6 when our Rafflecopter widgets will go live for your chance to enter! Or you can visit the full NPN Holiday Gift Guide from November 6 on to see and enter to win all of our fantastic prize packages at once!